Our home has been temporarily rearranged. The water bowl for the dogs and cats is now commonly found on the kitchen counter while the bathroom trash cans currently reside atop the closed lids of the toilets. A paper grocery bag containing paper recycling was handily located in the kitchen. Lately it can be found a few feet away in a lower level vestibule, which is inaccessible to the littlest resident of our home who knows how to climb up, but not down, stairs. She mastered stair ascension when she discovered the bin of bath toys hidden in the empty tub, alongside of which is a single step. Lyra, our curious baby, is on the move and eager to exercise her self-determined mission: find all containers, empty them of their contents and, before spreading said contents far and wide, taste as many of them as possible. Hence, the reorganization of our home, something I have had to do four times before when each of my boys were curious and accomplished crawlers. She may be older than they were at this stage, but she doesn’t look it. Furthermore, her mind works just as theirs did—once a container full of clean diapers or dirty trash, toys or recycling (all equally appealing it seems), has been discovered, the site is frequently revisited. From my earliest conception of Whoopsie Piggle, I planned to write about our entire family and not just our youngest child, Lyra, and her diagnosis of Down syndrome because her diagnosis neither defines who she is as a person nor who we are as a family. Yes, her diagnosis helps us to understand her needs in order to better meet them, just as the diagnoses of dyslexia helped us to meet the needs of her older brothers, Claude and Jules. In fact, in the past few months it has been harder to write essays isolating the latest in Lyra’s life. On occasion we have bigger issues to address, but most days are entirely mundane and typical of any household with a crawling baby. Lyra is no longer brand new. She exhibits a fully formed personality with many things that make her giggle (her brother Leif, getting tossed in the air, singing to the pretty baby in the mirror, kisses on her neck) and others that make her howl (diaper changes, bedtime, hunger, blood draws, contact lens changes). Lyra is an integrated and integral member of our family. Certainly she has made great developmental strides thus far this year and yet this fact makes her seem all the more typical and her accomplishments less, not more, noteworthy. The first few years of life for a child with Down syndrome often require regular interventions in order to acquire well-developed gross motor skills (sitting up, crawling, walking, running) and fine motor skills (i.e., purposeful hand skills such as self-feeding), and speech. The common culprit underlying these delays is not necessarily a cognitive issue, but hypotonia, or low muscle tone, which affects almost all babies with Down syndrome. In talking with parents of older children with DS, including adult children, many recall the constant work in the early years of their child’s life. Since she was three months old, Lyra has had regular therapies (speech, physical and occupational). For the last six months, she has gone twice a month to Akron Children’s Hospital for what they call an “infant block” in which all three of her therapies are conducted back-to-back by a team of therapists who discuss and coordinate her care. When older children and adults receive therapies, as many people do after an injury or medical event, the therapist trains the individual. But when the client is a baby, the therapists train the caregivers more than the client. Yes, Lyra recognizes her therapists and knows her way around the room where they conduct her appointments. But to Lyra therapy must seem like a play date. The occupational therapist blows soap bubbles for Lyra to pop with her forefinger, the speech therapist looks into a mirror with Lyra as together they sing songs and practice sounds, and the physical therapist pulls out toys that engage Lyra so deeply she doesn’t notice she had to climb a small hill or stand up on her own to reach whatever bright, noisy (and oh-so-non-Waldorf) plaything the therapist uses as bait. And then we try to replicate it all at home. Meanwhile, back at home, Lyra is also visited by her Summit County Developmental Disability Board caseworker and her Cleveland Sight Center caseworker, both of whom observe her progress and also make recommendations, generally taking into account our home environment. For example, instead of buying an expensive Little Tikes climbing wall, as Lyra’s pediatrician had urged, they helped me arrange the tumbling mat we own over some pillows, which Lyra now repeatedly climbs up and over. Sometimes the folks coming to our home tell us the very same thing I hear at the hospital. Other times, they do not. For example, after Army-crawling for three months, Lyra began crawling on her hands and knees and soon thereafter she started what we call “bear-walking,” or walking on her hands and feet. And even though it has given Lyra a speed and facility at dumping out trash, recycling, toys and whatever else she can find, we have been rooting her on. It’s thrilling to see her motor around and the hospital’s physical therapist agreed. Her caseworkers were less excited. Sure, it’s great that she’s getting stronger and moving. But her back legs were being held too far apart, like an upside down wide V, putting pressure on her hip sockets. Along with hypotonia, people with Down syndrome commonly have ligament laxity and by stressing the exterior of her hip sockets, the caseworkers explained, Lyra can wear down her ligaments thereby opening the door for a host of other issues, including chronic pain. The solution? Hip Helpers. We used these many months ago, when Lyra was learning to sit up on her own, but they were all but moth-balled since Lyra took off Army-crawling in January. Like a pair of tight spandex shorts, Lyra’s daycare provider and I both refer to them as Lyra’s “Spanx,” the modern day equivalent of a girdle. Hugo calls them Lyra’s “mermaid thingies” as they keep her thighs together like a big fish tail. Under her dresses and skirts, Lyra’s Hip Helpers look like baby shorts, stylish even. With them on, however, she cannot zip around as easily. For now, that is. The goal is to retrain Lyra’s legs to move correctly, and not splayed out, as she ambulates, something she is highly motivated to do (so many trash/toy/recycling bins, so little time). For two weeks, Lyra wore her Hip Helpers all day, every day. Then we had our next Infant Block appointment at the hospital where the physical therapist pointed out that Lyra locked her knees more when wearing the Hip Helpers. Also important, the hospital therapist questioned making Lyra struggle with a skill she had just acquired (bear crawling). And so, we agreed upon the middle path (or the Buddhist take on pretty much everything)–not too much, not too little and, as of this week, our busy monkey spends about half her days in her Hip Helpers. I just saw an adult with DS at the movie theater and I wanted to run up and hug him. It was like a celebrity sighting LOL. Is that just me? ~A post on a Facebook group for mothers with babies born in 2012 and 2013 and diagnosed with Down syndrome. I laughed throughout most of Snow’s routine at a new parent event sponsored by our local support group when Lyra was only a couple of months old. But as he described staring at the girl and not finding a way to talk with her mother, color rose up my neck and my ears became hot with embarrassment. When Lyra was perhaps a week or two old, we had taken her and the boys to Five Guys Burgers for lunch. Asleep in her car seat, Jules sat with Lyra at a table while the rest of us got in line. Behind us, but separated by another group of people, was a family that reverse-mirrored our own—instead of four boys and a baby girl, they had several daughters and little son, who appeared to be about Leif’s age, which was two-and-a-half at the time. Leif and the little boy pushed the red cordon, hung between posts to form an orderly queue at the restaurant, with their hands to make it swing back and forth. The two little boys were twin-like–they stood at the same height, had equally white-blonde hair, and deep blue eyes. But the other little boy’s eyes had the characteristic shape associated with Down syndrome. Staring does not describe my behavior. I scrutinized the child, who had on a red zip-up hoodie from the Gap and blue jeans, an outfit nearly identical to Leif’s, and only tore my eyes away to shyly smile at the child’s father, a big man with a beard who smiled in return. I wanted desperately to tell him and his wife that my new baby had been diagnosed with Down syndrome but I was uncharacteristically struck speechless. In the first few months after Lyra was born and we learned she has Down syndrome, I regularly wondered how having an extra chromosome would effect Lyra. Would she talk? Would I be able to understand her? Would she develop like other children or would she be a perpetual infant? I did not know and nobody could tell us. Sighting an older child, even one who was only two or three years old, when Lyra’s life had just begun, loosened my mind’s grip on my worst fears by showing me: This too is possible, a child more alike than different. Last weekend, we were seated in the waiting room of the lab at Akron Children’s Hospital where we take Lyra quarterly to have her blood drawn for a thyroid level check. A woman and teenaged girl with Down syndrome walked in and I (rudely) listened to the mother give her daughter’s date of birth to the receptionist. The girl had recently turned fourteen, which makes her only a couple of months older than our son Jules. With Lyra in my lap, the mother and daughter began talking to us before they sat down. “She loves babies,” said the mother. “Yes, I do!” said the daughter. When the phlebotomist called for Lyra, Max took her back while I stayed and talked with the two women, and a pattern I’ve now seen many times emerged: the daughter spoke and then the mother repeated and/or clarified what her daughter said. Me: I love your nail polish. Girl: My mom did my toes, but I did my hands. Mom: I did her feet, but she did her fingers, well, most of them I see. She’s so independent; she tells me all the time, I’ll do it myself! Me: What grade are you in? Girl: Seventh grade. I love school, I’m a cheerleader. Girl: Yes, I’m a cheerleader. Mom: She’s like a rock star at her school, seriously. We stopped talking when Max brought out a sobbing Lyra with both elbows wrapped in Day-Glo pink cling tape, used these days instead of Band-aids to hold a gauze compress at the site of the blood draw. They had not been able to get a sample of Lyra’s blood and Max described a scene I’ve witnessed all too often in which the phlebotomist sticks Lyra’s arm with the needle but cannot find the vein and begins grinding the needle around in her arm in an attempt to locate the vein. We were told to bring her back on another day for another round of this torture. As I begin comfort-nursing Lyra, the girl I had been talking with was called back for her blood draw and in what seems like less than a minute, she’s back out, tear-free. “Wow, that was fast!” I told her. “Yeah, I’m a big girl,” she said and Max slapped her a high-five. “20/270, that eye is legally blind and 20/180, that eye is what they call ‘legally visually impaired’ but any school district would categorize her as legally blind,” said Lyra’s vision specialist. I paused and thought of something I had long noticed: when Lyra is in my arms, her eyes are wide open, big and blue and often staring into my own. But when she is more than a couple feet away, she squints. I have a hard time capturing her in photos without her squinting, but usually when I am taking her picture, I am more than a couple of feet away. Just as when I try to read the clock in the morning without first putting on my glasses, Lyra squints in an effort to see more clearly. “So what about when she’s out? She will need a cane then?” The notion of Lyra walking with a cane suddenly became emblematic of everything I feared about her being blind: With just a glance, anyone would recognize her two disabilities for which she may be unfairly assessed as not capable of any number of things she deserves, including employment, housing, and civility. “Ahh,” I say as it all starts to click. I’ve long known that Lyra’s ophthalmologist does not like to talk about Lyra’s vision, or about what procedures, or outcomes to anticipate. I know this because he’s told me as much. I chalk it up to needing to wait and see how Lyra develops. If she does great with contact lenses, stick with contacts and avoid more surgery. At her strabismus surgeries last summer, her ophthalmologist told us that as she got older he would be able to put her in different, less bulbous, contact lenses. Her vision was corrected for the world of a baby, roughly up to two feet away, but he said that he’d change her correction as she got older and began walking. Because of these conversations, we believed all along that Lyra was seeing, well normally, like most any other baby. Instead she’s legally blind. I only worried about it when another mother wrote to me, a woman I do not know but who recently was put in touch with me by a mutual friend. This woman’s son, who is a few months younger than Lyra, was also born with bilateral cataracts and now sees at 20/60 and 20/90 and she was worried about what his future would be like. I wrote and told this mother what we are doing for Lyra but never heard from her again and I wonder if it isn’t because Lyra’s vision is substantially worse than her son’s vision. Her letter inspired me to call Lyra’s vision specialist and ask her to sit down and tell me what a vision acuity score of 20/180 and 20/270 mean for Lyra long term. I imagine had the ophthalmologist told me in detail at Lyra’s first surgeries, more than a year and a half ago, what we would be facing when she was older, it would have overwhelmed me or, at the least, been so much information on top of the information we needed in the immediate moment, that I would have forgotten much of what he said. To be honest, perhaps he did tell us much of what we now need to consider and it did slip into the cracks of my overloaded brain. Climbing mountains, no matter how high, happens one step at a time. Lyra will turn two in August. She talks, uses sign language, plays with her brothers and her daycare friends, sings songs, makes animal sounds on her own and when asked, crawls, “sorts” laundry, pats my back just as I pat hers, just as all my babies often patted my back when held up to my shoulder because that is what I do to them. Lyra’s daycare provider could not love Lyra more if she were her biological niece. Everyday of her life, everywhere she goes, Lyra is encouraged to move her body in ways that will protect her health long-term, and avoid issues such as displaced hips and pronated feet. We did not anticipate how musical Lyra would be when we gave her a name related to the word “lyrical.” Perhaps the name was providentially chosen for nothing pleases Lyra more than singing. Much of her speech has developed through song, she is calmed by song when sad and I even use it as part of my arsenal to distract her when need be. Placing her in front of the mirror on my dresser, Lyra and I sing together while pulling her hair back into a ponytail, something she otherwise resists. 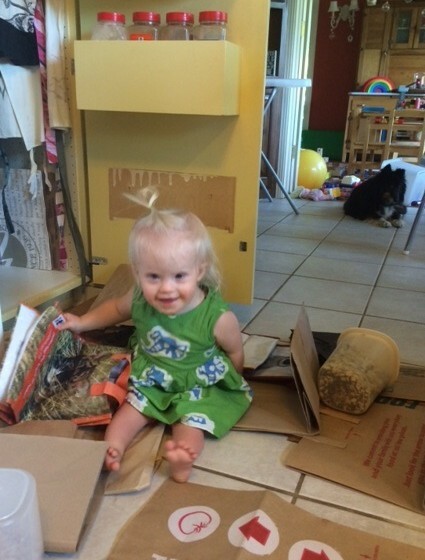 For several weeks, Lyra’s team, including everyone in the family, her therapists and her daycare provider have talked about how it’s coming together beautifully for Lyra and all the progress she has made and continues to make. At Akron Children’s Hospital, the therapists tell me, each and every visit, what a thrill it is for them to see what new things Lyra has learned since her previous visit. Learning Lyra is legally blind was not devastating, but to use a cliché, I felt the wind drop from the sails of all that wonderful momentum in Lyra’s development. This too? Isn’t Down syndrome enough? But that is me feeling sorry mostly for me and not Lyra who, after all, only knows what she knows. For her, life is full of loving people and good times. She’s as happy as a baby should be and not moping about because she has to work harder to crawl and can’t see as well as anyone else she knows. Again, for now at least, she isn’t aware of any differences. Who knows how she’ll feel one day when she does realize how her life is different? My personal experience now having met so many people of all ages with Down syndrome, as well as the scientific research, gives me every reason to believe Lyra will be happy with who she is. So we breathe in, breathe out and pick up the phone. First call: The ophthalmologist to learn what we can do to improve Lyra’s vision before she turns five years old. Second call: The vision specialist to learn what compensatory techniques Lyra can begin learning now. And, as with all things, our journey continues. One step at a time. This entry was posted in Lyra's Latests, Uncategorized and tagged bear crawling, Brian Skotko research on happiness in people with Down syndrome, Hip Helpers, Infant Block of therapies at Akron Children's Hospital, legally blind baby with Down syndrome, more alike than different, pediatric blood draws, pediatric ophthalmology, Physical therapy for children with Down syndrome, Rob Snow, Stand Up for Downs, when therapists disagree. Bookmark the permalink. Great to read about you all – wish we could see you!! Love you, mama!! Follow Blog via Email - and you'll never miss the latest on Lyra.